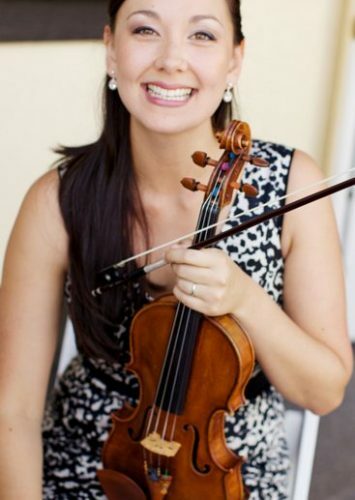 Alana is both a gifted performer and dedicated violin teacher who has developed a palate for all genres of music. She is passionate about small ensemble and orchestral performance, and has worked with many of the leading talents in Canada. Alana currently performs with the Vancouver Symphony Orchestra and the Vancouver Island Symphony. Alana’s musical education began with many reputable orchestral training programs such as the Symphony Orchestra Academy of the Pacific, and the National Youth Orchestra. She obtained her Bachelor of Music in Violin Performance from the University of British Columbia in 2007, and studied with Andrew Dawes, Jasper Wood and Nancy DiNovo. Her experience in the industry is very diverse; she has shared a stage with classical musicians such as Pinchas Zukerman, James Ehnes, and contemporary artists such as Barbra Streisand, Michael Bublé, and Kanye West. Alana was recognized for her success in chamber music performance with the Friends of Chamber Music Competition in 2004. In 2010, Alana co-founded the RSVP Recital Series and continues to showcase much of Vancouver’s local talent in composition with various contemporary ensembles. Alana enjoys teaching private and group classes using both the Suzuki and RCM methods. The abilities of today’s young performers continue to fascinate her; she hopes to nurture the drive and curiosity of the next generation of musicians.